Yesterday I came across an early era photograph of a young woman on a beach and decided to attempt an oil painting of it. The original photograph was taken by Adolf Miethe in Germany circa 1903. In that era there was no colour photography per se, but photographers printed from three colour-filtered black-and-white negatives made with a camera which was in fact designed by Miethe. The better-known early colour photographs of Sergei Prokudin-Gorskii, Miethe's pupil, were made with a similar type of camera. 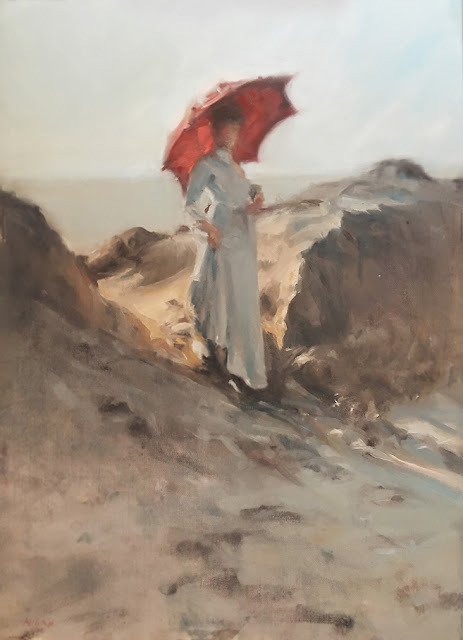 The photograph reminded me of those early impressionist paintings of women on beaches with umbrellas and this particular scene had a beautiful mix of warmth and cool hues, along with the slither of light streaking through into the shadows of the sand dunes. A majority of the colouring in this painting are greys and blues, and yet, the image has a warmth to it with that small passage of sun. I used a limited palette, also known as the Zorn Palette, which is named after a Swedish painter from the 1900s who used only red, yellow ochre, along with white and black in a lot of his paintings. It's surprising what colour range is possible with this limited palette. It also tends to create a colour harmony in the final painting. My work of late has been taking a turn for more expressive, loose brushstrokes and a less 'tight' and refined finish. I find that my painting forms itself with that element of freedom, rather than meticulously trying to put down every fine detail to create the form. I'll explore this concept more in future writings.